Non-Ferrous Metal Works (Zambia) Ltd, has long been recognised as one of the leading foundries in Zambia, with over 50 year’s experience. The company was established in 1965 as a metal trading company, with a small foundry division engaged in the manufacture of Lead and Tin based alloys. Realising the need for locally manufactured machinery spares, components, etc., the company embarked on a modernisation programme in the early 80’s. A new foundry complex was constructed, and equipped with modern Inductotherm Induction furnaces, a centrifugal casting machine, a green sand recycling plant and moulding machines. Non-Ferrous Metal Works (Z) Ltd is a primary supplier of quality castings, in Bronze, Brass, Aluminium, Copper, Grey & White Cast Iron, and a recent expansion in production of Steel, Manganese Steel & Stainless Steel. We offer a wealth of casting experience in all aspects of non-ferrous, cast iron & steel: from pattern making, moulding, casting and to the finished article. We have the ability to fulfil a customers most demanding requirements from either a sample or engineering drawings, to your specification, whether it is a simple or highly complex casting, from a one-off casting for an urgent breakdown, to a large volume production run. Our ultimate goal being to supply a quality casting, delivered on time and at a truly competitive price. Much of our business is producing spare-parts, reducing the need to import parts, saving you; having to source the items abroad, time and foreign exchange, all-in-all resulting in substantial cost-saving benefits for our customers. 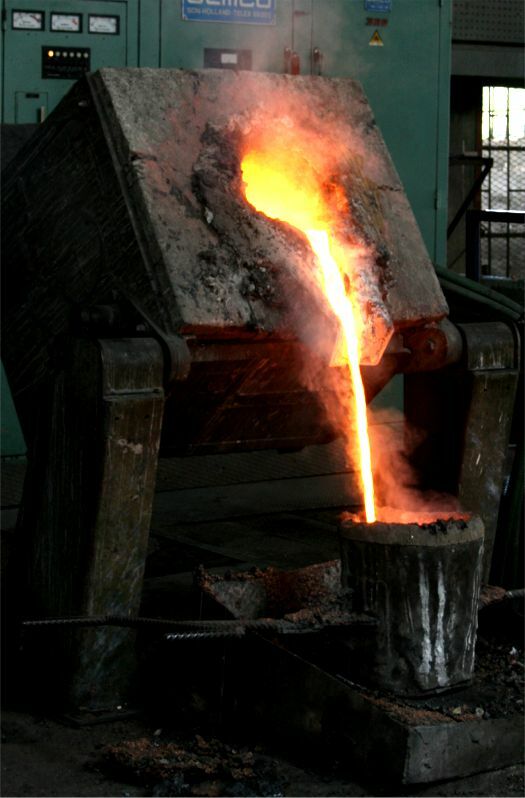 Over the years we have maintained our reputation for reliability and quality, producing a wide variety of castings ranging from 0.1kg to 600Kgs in weight, for customers in a variety of industries, including the mining, engineering, agricultural, milling, drilling, electrical, municipal, petrochemical and construction industries. To use our long established wealth of experience to be the leading supplier of high quality non-ferrous and ferrous castings, delivered timely and at a truly competitive price. 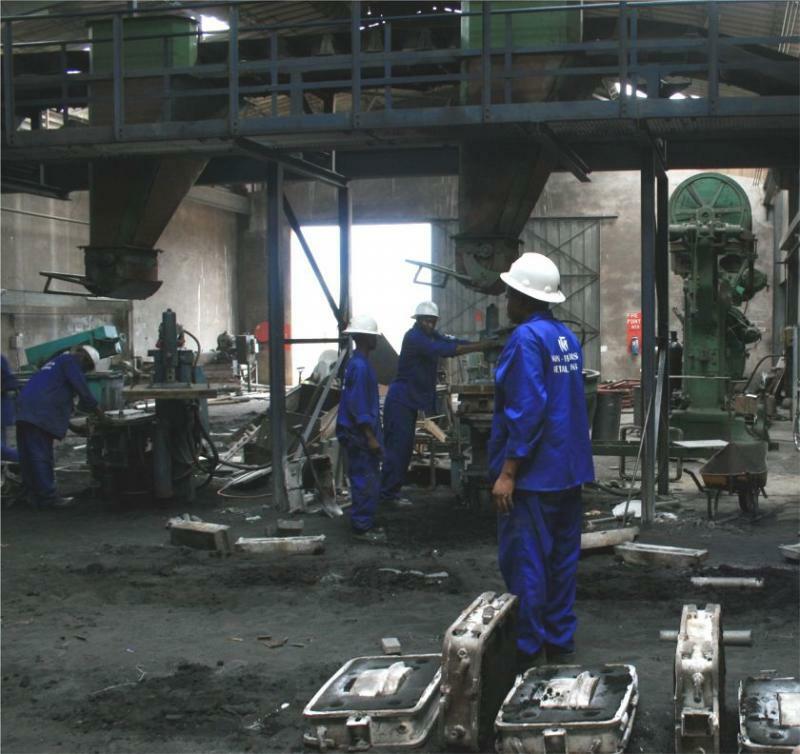 Non-Ferrous Metal Works (Z) Ltd is based in Ndola and has a skilled workforce of around 56 personnel. 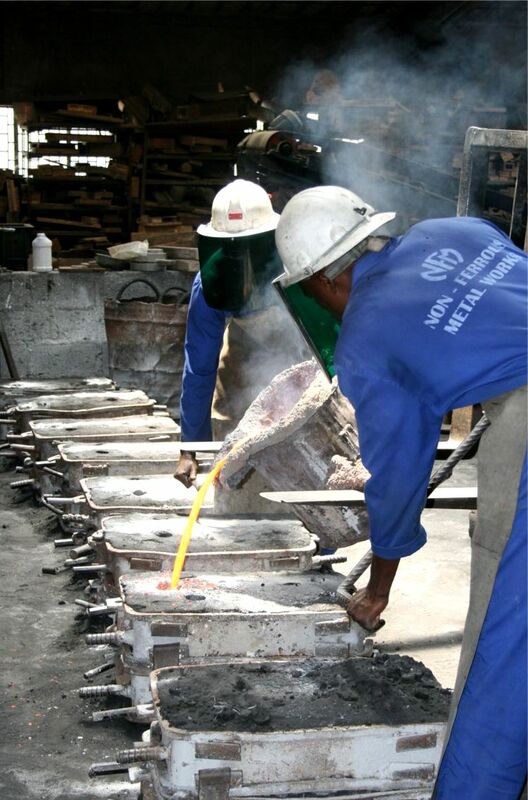 The foundry has a casting capacity of 20M/T per month for Non-Ferrous and 35M/T per month for Steel & Cast Iron. Copyright 2012 Non-Ferrous Metal Works (Z) Ltd. All rights reserved.